On a recent trip northwards, we found ourselves in Ashland, Oregon around dinner time, so we headed downtown to find something to eat. 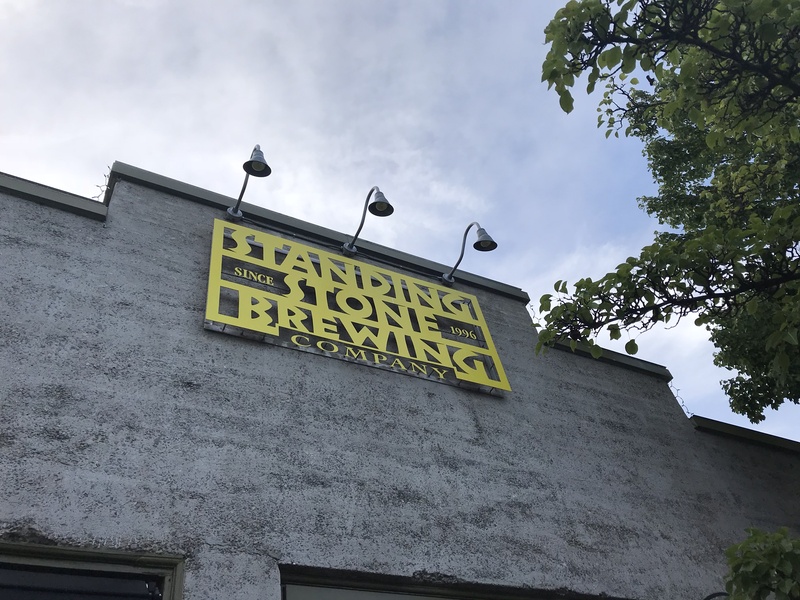 A quick web search informed me that there were two brewpubs in town, and on advice from a local (our Lyft driver), we elected to go with Standing Stone (over Caldera), which also matched with my instinct from looking at the web search results and Yelpage. 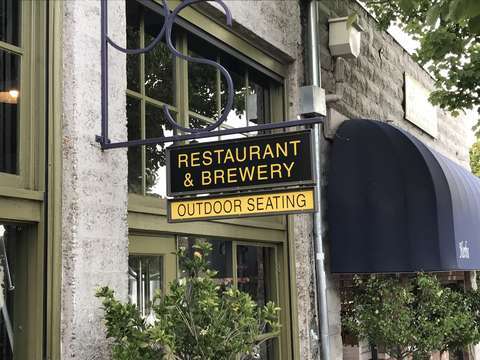 The brewpub itself is welcoming, with a bar on the left side of the front of house, and some tuns and brewing kit on the right side. The kitchen and dining area is behind all of that, and there is a generous outdoor patio at the very back for additional seating for diners. 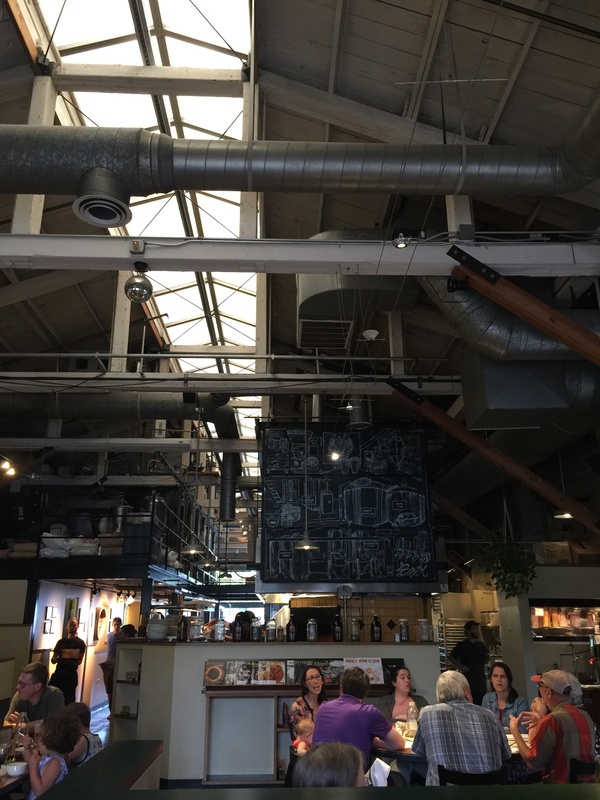 Above the kitchen is a large chalkboard with drawings of the various stages and equipment needed for brewing. It&apos;s actually very well laid out while still being attractive, with the typical faux-industrial aesthetic mixed with a kind of artistic feel one might expect from Ashland. We were seated in the indoor dining area, and given some time to browse the menu. 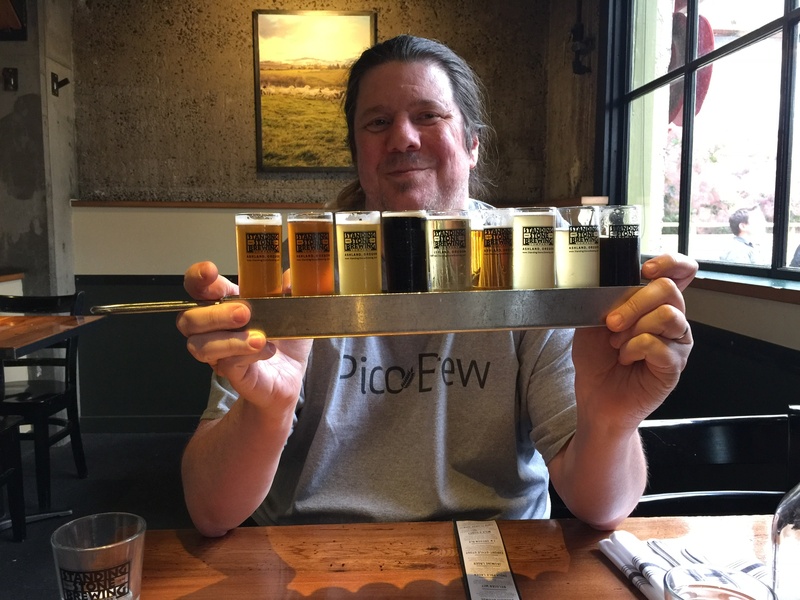 The brewery works with local farms, both for brewing and for sourcing ingredients for the menu, working the whole "farm to table" approach quite well, without overly milking it. Thankfully, they&apos;re not overly vegan-leaning, so they had a good selection of dishes available for the carnivorous amongst us - mostly tennis towards pub fare - whilst also having enough selection that my wife could have a gluten free option that met her tastes. I ordered a burger with clam chowder instead of fries; my son had a duo of soups, and my wife a salad. But ultimately, I came here for the beer, so enough of this food and restaurant nonsense, and on to the beer! 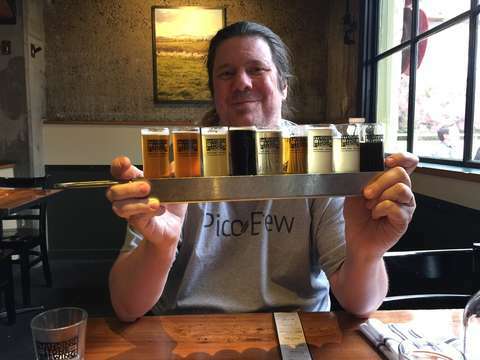 They had a generous selection from which to choose, and without being stingy, they have a full flight sampler, which I ordered, and very soon after arrived a long metal holder containing shot glasses of all 9 of their current brews. Export-Style Stout - this was quite well executed, a solid stout with distinct notes of coffee and even a hint of chocolate, with just the right balancing hop bitterness. Excellent! I ❤️ Oregon Ale - citrusy, grapefruity ale made with all Oregon-grown malts and hops. Quite decent, I liked it. Milk & Honey - the generous lactose and honey give this a mildly sweet taste, without being cloying. Very drinkable. Overall a quite impressive selection, and all drinkable, with a few being actually excellent. For a brewpub, with focus on both brewing and dining experiences, this is unusual, in my experience, and I can definitely recommend this place for any beer officianadoes traveling through the area. Give a stop and check the local scene, and drop in at Standing Stone to tilt back a few; I think you&apos;ll enjoy it!